Rheumatic heart disease is a condition in which the heart valves have been permanently damaged by rheumatic fever. The heart valve damage may start shortly after untreated or under-treated streptococcal infection such as strep throat or scarlet fever. An immune response causes an inflammatory condition in the body which can result in on-going valve damage. Rheumatic heart disease is caused by rheumatic fever, an inflammatory disease that can affect many connective tissues, especially in the heart, joints, skin, or brain. The heart valves can be inflamed and become scarred over time. This can result in narrowing or leaking of the heart valve making it harder for the heart to function normally. This may take years to develop and can result in heart failure. Echocardiogram (echo). This test uses sound waves to check the heart's chambers and valves. The echo sound waves create a picture on a screen as an ultrasound transducer is passed over the skin overlying the heart. Echo can show damage to the valve flaps, backflow of blood through a leaky valve, fluid around the heart, and heart enlargement. It’s the most useful test for diagnosing heart valve problems. The best treatment is to prevent rheumatic fever. Antibiotics can usually treat strep infections and keep rheumatic fever from developing. Anti-inflammatory drugs may be used to reduce inflammation and lower the risk of heart damage. Other medicines may be needed to manage heart failure. People who have had rheumatic fever are often given daily or monthly antibiotic treatments, possibly for life, to prevent recurrent infections and lower the risk of further heart damage. To reduce inflammation, aspirin, steroids, or non-steroidal medicines may be given. Heart failure. This can occur from either a severely narrowed or leaking heart valve. Complications of pregnancy and delivery due to heart damage. Women with rheumatic heart disease should discuss their condition with their healthcare provider before getting pregnant. 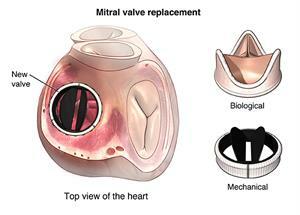 Ruptured heart valve. This is a medical emergency that must be treated with surgery to replace or repair the heart valve. You will need to have ongoing follow-up with your healthcare provider to check the condition of your heart. Depending on the amount of heart damage, you may have some activity restrictions. Your healthcare provider may recommend that you take antibiotics for an extended period to prevent another infection of rheumatic fever. Rheumatic fever is an inflammatory disease that can affect many connective tissues, especially in the heart.